There are about 13 million people with a disability in the UK. According to the Equality Act 2010, a person is regarded as disabled if they have a physical or mental impairment that has a substantial and long-term negative effect on their ability to complete usual daily activities. For example, a genetic disorder such as Usher syndrome, a rare form of congenital deafblindness, would be considered a disability but a broken leg would not. For a fluctuating condition such as fibromyalgia, however, it may depend on the individual concerned. 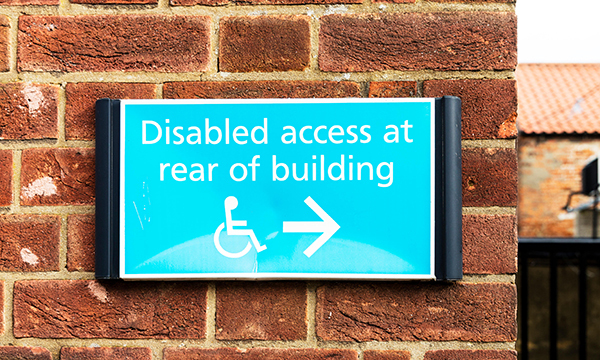 The legislation says reasonable adjustments should be made to avoid substantial disadvantage and provide support to people who are disabled, for example in terms of the environment, technology or communication. But some say there is still more to do. It can be argued, for example, that it is reasonable for a loop to be provided in a bank for a person with hearing difficulties, for medical information to be provided in Braille format for a severely sight-impaired person and for easily accessible toilets to be provided in a place of work, healthcare settings or educational establishments. However, consideration should be given to whether the adjustment comes with a huge price tag, particularly for a small business. If the cost would lead to the business collapsing, would it be a reasonable adjustment? Not all reasonable adjustments need to have significant financial implications, as highlighted by an innovative idea from the Bridgend Coalition of Disabled People to introduce a rating scheme to make surgeries, shops and restaurants more accessible to people with a disability by showing if premises have hearing loops, Braille menus and wheelchair-friendly toilets. Innovations such as these represent a step in the right direction but, even when adjustments are made, unless staff are ‘disability aware’ and receive training to understand how to implement these adjustments, there will be no benefit. Some disabilities, such as those necessitating the use of a wheelchair, are noticed while others are not. The latter include autism, acquired brain injury, cancer, mental health issues and sensory impairment such as D/deafness and D/deafblindness. For senior nurses in leadership positions, ensuring staff are aware about disability is therefore crucial, because many health service users will have a disability that may not be obvious. There are seen and unseen disabilities among the healthcare workforce too. Simple adjustments such as enhanced lighting, information presented in audio format or using colours to accentuate door frames or steps can make a big difference for people with visual impairment, as can the use of a visual fire alarm, loop, interpreter or lipspeaker or the provision of speech recognition software for a person experiencing D/deafness or with a hearing impairment. Although it is a case of ‘watch this space’ with regards to the implementation of reasonable adjustments to support people with a disability, it is clear that there need to be discussions with people with disabilities because they experience barriers on a day-to-day basis. Doing this may create innovative ideas and an awareness and understanding of which reasonable adjustments could have the most positive effects on the lives of people with a disability, seen or unseen. Senior nurses in different healthcare settings have an important role to play in raising disability awareness and ensuring reasonable adjustments are implemented. British Deaf Association (2015) What is Deaf Culture?